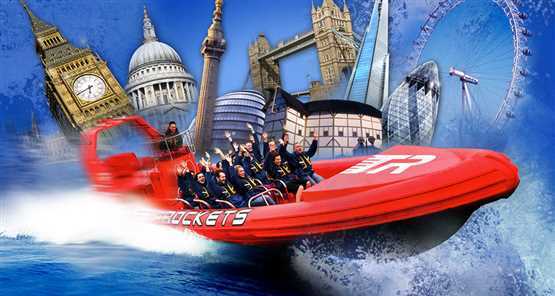 This Thames boat trip is wild, fantastic fun for all ages, this high speed boat trip is an extravaganza not to be forgotten. Speed through London at 35 knots as the Thames is eaten up by 630hp. Zoom under the capital’s famous bridges and marvel at London’s landmarks from your exclusive vantage point. Music classics are piped through the onboard sound system as you power on through the capital and out towards the docklands. Our award winning comedian guides and west end actors ensure sparkling highbrow banter as you 'pull G' past MI5 before holding on tight for an exhilarating trip to Canary Wharf and back mission accomplished on this exhilarating Thames boat trip. This trip departs hourly from the London Eye Pier, 7 days a week, all year round. It is suitable for all ages from 4 to 104. This ultimate sightseeing adventure is great whatever the weather, wet weather kit can be provided for all ages and sizes. Exact departure times vary so please choose from the supplied options when booking and we will book you in for as close as possible to the requested time. Honestly spoken this was the best we did in London up to now. It was horribly cold, but an overwhelming experience. Thanks to the Thames Rockets again!! Had a fabulous time on the boat even in the pouring rain, Rebecca our tour guide was very informative and personable. Highly recommend the experience!! Brilliant! Was fun and exhilarating. Stacey and Andy were great and we will definitely book again. Boat trip with a difference! Many many thanks to Matt and the crew who took us on a whirlwind trip up (or is it down) the Thames. Very knowledgeable and informative and great fun. Highly recommend and would love to do it again when we next come to London. Many thanks to all involved. Thanks to you and your team! We were provided with great service and the journey was just amazing. Thanks to Stacy who made our journey very fun and entertaining. My partner and I had the best wedding anniversary day out! What a great day spent in London with my son and grandchildren. The RIB experience was the ultimate thrill ride which we all thoroughly enjoyed. Our driver, Ian, showed what an experienced speed boatman can do with his craft. Our guide, 'little Mike', (Robin Williams lookalike! )was attentive, clear, informative and fun. In all a superb trip, highly recommended.